The initiative, which is to take place in all Marriott International properties across Asia Pacific from Monday to Friday, is aimed to attract new talent while inspiring current associates to aim high. The St. Regis Maldives Vommuli Resort is hosting a range of events for its current team as well as new talent on the islands, where senior leadership associates will share their career journeys to inspire others to reach their own career destinations. 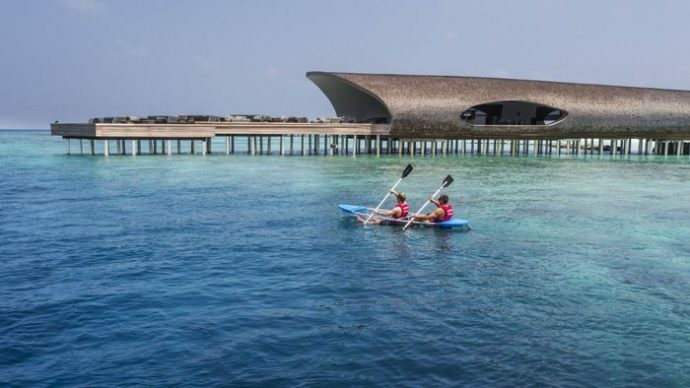 “Journey Week will encourage and inspire our associates and new talent in the Maldives of the world’s largest hospitality group to create their own future and shape the company, and also show potential employees why Marriott International is an employer of choice,” Alexander Blair, General Manager at The St. Regis Maldives Vommuli Resort, was quoted in a statement, as saying. There is a focus on women leadership roles, where inspiring female staff members at the private island resort are showcasing and emphasising their progression and journey throughout each stage of their career. The team visited Hulhudheli School on Monday to talk about opportunities in different departments in the hospitality industry, supported by a video on women leadership and followed by a panel discussion. As part of Journey Week, talks on career guidance will be held at the resort on Tuesday in addition to an open house at Maldives National University on Thursday. Candidates are encouraged to interact with the volunteers and share their applications at the Marriott stall, after attending the presentations and panel discussions hosted by the resort’s team. “Against the backdrop of increasing competition for talent and increasing growth of Marriott International in the region, it’s vital we focus on talent retention and attraction. Journey Week empowers associates with opportunities to have multi-faceted, meaningful careers,” Alexander said.